This is just the kind of thing I keep seeing so often. Not trying to take away any credit from Aamir Khan, but he does seem to be everywhere. Or maybe it was just his day on the 5th of August, in the newspaper Hindustan Times's Delhi edition. I am referring to the cutting posted here. The motivation for me to visit this page was the article titled 'Lord Voldemort in White Mughals Film Adaptation'. I have been a big fan of William Dalrymple and have read a few of his books, with my favorite being 'The City of Djinns'. This is the book that so beautifully combines aspects of history and traveling. And something from this book made me find history so amazing and interesting. I guess my hidden interest was just waiting for the right trigger, and I there I got it. I would not have found History interesting in high school, as compared to Maths or Physics. But now, it very easily tops the chart for me. Anyway, one of Willam's book 'The White Mughals' is being proposed for a film adaptation. Awesome. And digging more into the subject, and a bit of googling, it transpires that Aamir had approached William to produce the film under his banner. Even though William was not much inclined, Aamir made his try and bet. 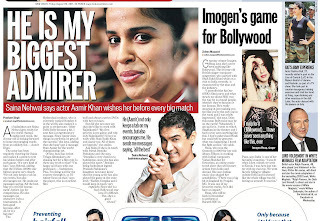 Once there, I could not ignore the article talking about Imogen Heap's tryst with India and Bollywood. In midst of the typical westerner-goes-to-India lines talking about curry and Bollywood and dancing, there was something new for me. It said 'Imogen is working with Indian music composers Vishal-Shekhar for Dewarists, an online music travel show that will feature artists from India and abroad'. Interesting. I looked up the page of Dewarists. Saw some artists, and stumbled upon the fusion sounds of one of my favorite Indian rock band, Zero, with a sitar player. Browsed through other artists, and there I hit upon a familiar face. She was Monica Dogra, one half of the Mumbai-based electro rock duo Shaa'ir and Func, and someone who you might remember from the Aamir Khan production 'Dhobi Ghat'. Well, there was another link to Aamir Khan. The third link was clear to see on the page. 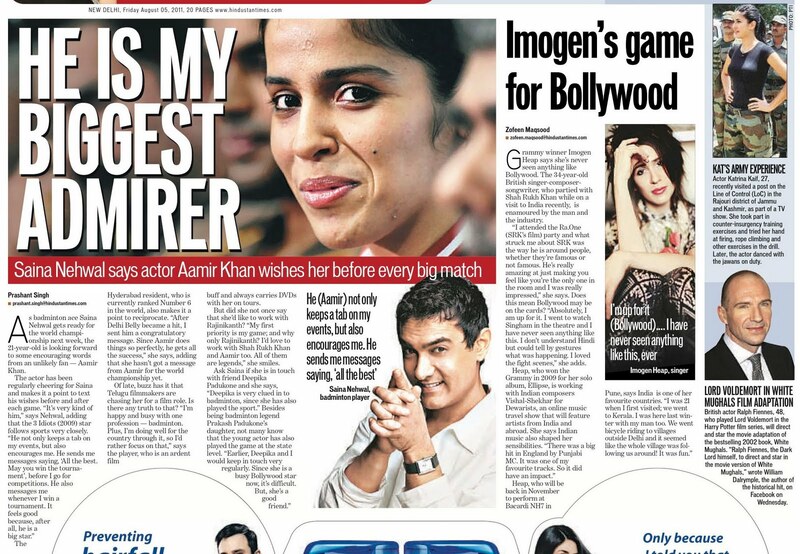 Sina Nehwal was proud to say that Aamir Khan wishes her before every big match. She is a talented badminton player, and Aamir is a talented film actor, producer, and connoisseur. Sitting in front of my computer screen, just back to Copenhagen after a month long vacation, it is but natural (at least for me) that my mind is not here and is miles back in India. It is often not possible to keep the mind bounded on top of oneself. It is surely good for the mind to keep traveling like this so effortlessly and without any restrictions. No immigration checks, no security checks, no heavy backpacks to carry all the time, none of the hassles of jet lag and so on. It took me nearly 24 hours from the moment I stepped out of my home in India to the moment I stepped in at my home in Copenhagen. Human technology at work seems so slow as compared to the technology of nature that you sometimes wonder if humans could get there ever. But it is good also for me, as my mind can also send signals back quite instantaneously, making me feel as though I am right there on the spot and traveling and moving, seeing and feeling the buzz around me. Things are quite calm here in Copenhagen, enough to decode clearly every signal being sent back and try to make sense of it all now. I can see the chaotic traffic around me while I was stuck in a traffic jam in Amritsar. The driver decided to take us through a terribly congested and narrow street. A medium sized bus, stuffed with excess baggage from tourists, all coming from the the Wagah border after the border closing ceremony in the evening. Some of them were traveling across the border from Pakistan itself, unlike some others like me who went to the border just to observe the ceremony from the Indian side. The street in Amritsar seemed to be getting more and more congested as we went deeper and deeper in it. And the Sikh driver was getting more and more impatient, as were the people stuck on the left, right, back and the front side of the bus. We were literally surrounded by cycle-rickshaws, auto-rickshaws, cycles, motorbikes, cars and pedestrians. Shop owners were getting out of their shops and staring at the helpless people. The exhaust from the vehicles and noise of accelerating engines was creating more pollution. By the time, we could breathe some fresh air, as we saw the end of this never-ending street, the driver’s foot went full force on the accelerator and back with full force on the brake. He was getting really desperate now with the need to speed. We reached the Golden Temple soon after that, wondering what the hell was that. It was an experience. A few hours ago at the Wagah border, we had our share of fun. To start with, we reached there in freezing cold, in an open auto-rickshaw. Three of us, tied inside our shawls, just counting the kilometers remaining to reach the border after having started from Amritsar. The rickshaw driver was just still; the cold seemed to have no effect on him at all. His arse was resting on a seat right on top of the engine, which probably helped him warm up. The energy at the border was astounding. Nationalistic and patriotic songs from Bollywood were being aired with the help of huge woofers directed right towards the crowd. Surely, that did help raise the crowd’s spirits. A white dressed scout, shouting with the help of a microphone, was provoking the crowd as if a war was being fought and the side which could scream their throat’s out the most would win. Definitely, we could not hear anything from the Pakistani side, apart from a few slogans and little sounds. I guess they rather might have heard a lot from the Indian side, as we overtook them considerably in the number of people. With the border closing ceremony close to it’s peak, what could be seen clearly seen was that the entire ceremony might have been formatted over the years just to make it a show which unveils in the same fashion every single morning and evening. It was good to be part of it and be so close to the border. The feeling that 61 years back the same place might have been burning like hell was disturbing though. And today, it is a celebration; maybe for the peace at hand. Strange, that far away on either side of the border, tensions are so high. But right there, everything seemed quite amiable amidst a benevolent atmosphere. On the way back I got the chance to sit with the driver of the mini bus, in the cubicle of his. He had been living in Singapore for a long time, before he decided to come back to India and run a multipurpose mini bus in his birth city. Someday his bus would turn into a complete touristic service for a huge family or a set of relatives going to a marriage ceremony to a nearby place or on a religious pilgrimage. And the other day, the same bus would boast public transportation services in the city of Amritsar. Very much like every other small and private businessman in India, I could smell a mixture of several spices in the air, i.e. one man and many ongoing businesses. A grocery shop would also sell you mobile prepaid cards; just give your number and tell how much recharge you want; instantly your mobile would beep out the updated balance. A doctor’s clinic could also be an idling place for the neighbourhood’s old men who basically hang out there. They gossip on salaries in India, and also find it hard to understand where Denmark really is. All this while the doctor is also busy in the same conversation, making his patients wait a bit more. I hope the urgent cases are not dealt with in this fashion. A travel agent could also be a mobile phone mediator. As soon as you tell him that you are trying to sell a brand new Nokia phone which has just not been used because the font on the phone is too small for your grandfather to find any comfort, he delves into his secondary business attire and casually says, “Oh! Well I can buy it. How much do you want for it?”. And you reply with a modest, “Well, we were expecting 1200 rupees, as it is just out of the box”. He pleasantly accepts the deal and says, “Hang on right there. I will bring the cash back from my office upstairs”. The deal is done, before you get time to ponder upon it. And why not this. A valuable couchsurfer who hosts tourists in his city, could also be a small businessman at his level, by trying to help arrange things for tourists. He could take you to some of his friend’s shops and leave you to them to show you some artistic and literally tempting Indian produce. Or he could help you arrange a chauffeur driven car to your next destination. He might get a share in the deal, while the tourist duly gets a chunk of help in return. I totally support this mutual benefit concept, and must say we would have not been able to get things done in India until a local person is in the loop somewhere. I was a local person in India for my foreign friends; while for me, those people who showed us around and enlightened us with the local facts and information were the real localites. Everyone is a tourist, in at least some part of their own country, right?. Thank you for booking Turkish Airlines Copenhagen-Istanbul-New Delhi. Welcome to Istanbul and good news, your connecting flight is delayed by at least 1 hour. The flight is taking off 1.5 hours behind schedule. Welcome to New Delhi Indira Gandhi International Airport. All fine, the flight was great, food was terrific, air hostesses were beautiful, and it was not a long flight, just 6.5 hours of total comfortable sleep from Istanbul to New Delhi. But what was going on in my mind was - will I be able to make it to the domestic flight to my home city, Indore? You will find out in a bit. Before this time, I had taken the same bus service in New Delhi, but from the domestic airport to the international. That was late in the evening, and it was very very smooth. The bus in Delhi runs once in every 30 minutes and is not very crowded as well. Well air conditioned buses, to curb the heat of the city. Surely, I expected the same, for the other way round. As a result of which I booked my domestic travel home on a flight which was supposed to take off 3 hours after the Turkish Airlines flight landed from Istanbul. 3 hours, I thought, was good, to take the baggage, and then take the bus service to domestic airport and finally take the flight home. But it was not that easy. First of all, I lost 1.5 hours in Istanbul itself. That made the experience really interesting, to start off with. Next, at the international airport, Turkish Airlines flight landed around 5 in the morning which is the peak time for incoming flights to India, just like the peak time for outgoing flights is late night. I collected my baggage and rushed to the bus service counter - only to see an extremely long and haphazard queue. Crowded as the whole country is, crowded was this part of the airport, since there was the bus service point there, in addition to the prepaid taxi counter. I managed to find some other people who were in the same situation as me, and were desperate for an optimistic way out. Some people standing in the queue for the bus service were good enough, when we told them that our domestic flight leaves in an hour and we need to rush. They asked us to get in front of the queue and get access. We fought our way to the front, repeating the same thing and begging the same way to some other people standing in the queue as well. The door man, was kind enough as it turned out. We requested him the usual thing and he retorted, "Guys, I would suggest you take a taxi. If you take the bus, you will not be able to make it". Vow, what was that? Okay, no time to think, let's just do it. Now we had to do another round of begging, get first in the prepaid taxi counter queue. We managed to get there, the people standing in that queue also seemed good with a big heart saying "Jaao Jaao, go on, hurry up!". We got the taxi ticket, rushed out of the airport boarded a taxi, and off we go out of the international airport into the city. Since it was early morning, the roads were empty and we were able to rush. "Rush rush rush, bhaiyya! ", I was requesting the driver, as the other person sitting besides me was silent and thinking. "Why don't these two airports have a fast internal connectivity like a train or something? ", I said. "This is a must, specially if there is so much of traffic flowing between these airports". "They will take another 5-10 years to even think about this problem, lest the solution", said the person sitting beside me. That could be true. Things have a tendency of working really slow in India, and basic infrastructure needs are too high in our country. But slowly and steadily we are getting there. Finally, after 10 minutes, I could see the domestic airport glittering in a distance. I recognized it. Stopped, and rushed towards the entrance of the airport. The policeman sitting on the entrance gate was the next hurdle. He was sitting on a long round revolving chair with pretty much no work, as I made it to him quickly. "I have to checkin GoAir". I said. "Aah, the checkin for GoAir flights is not done on this floor". He replied. "You see a small gate there?". As I tried to see in the direction he was pointing out. "Go there and there is an elevator which will take you a level down. There is a terminal entrance there, where GoAir checkin counters are". "Bahut bahut shukriya", I replied thanking him. Had to bid a goodbye to my taxi partner as he would check in from the same floor, and ran towards the shown direction. Reached the terminal below that level and of course, I had to encounter another policeman there, right? Yes, I did encounter two of them at the same gate and there was a huge queue as well. I had around 20 minutes in the flight take off now. "Boss, I have a flight to take, I am running late, can you please check my identity first and let me in? ", I moved to the front of the queue and requested one of the policemen. "Why do you guys have to come late and then rush rush? ", he retaliated. "My international flight was late, it is not my mistake. Please do it quickly?". "Okay okay", as he looks at my e-ticket and passport, and allows me, "Chalo, jaao". Inside, I am run to find the GoAir checkin counters, run through the security scan of my baggage, and reach the counter in time. Another round of requesting, a couple of people in the queue, my luggage was checked in just in time as I could see another couple checking in for the same flight. I was well relieved. Security check was next, and boarding followed - even as the display panels didn't show anything about my flight, or probably showed "Boarding closed" even while the boarding had not started. In any case, I reached the airplane and found a nice person sitting next to me. I asked him, since how long have you been seated and the reply was "Not since a long time, the bus just came a couple of minutes before". He asked me why I was asking that, and I ended up repeating the entire incident to him, retrospectively and happily. Living abroad and thinking less-than-broad! Every society, community, nation etc. contains a mix of different types of people. Broadly, those who are good and also behave good, those who are good but behave bad, those who are bad but behave good, and finally those who are bad and also behave bad. The middle two categories of people behave so because of the situation at hand. They are not designed to behave that other way, but the situation could make them do so and bend the rules to some degree. But the first and the last categories of people are the perfect ones. Now, there is nothing good or bad about either one of them, judgment depends totally on perception. But they are the most perfect categories in my opinion, because they just do what they are meant to do and nothing else. Predictable and not complicated at all to understand. I would like to focus on the very last category of people, who don't leave any stone unturned in proving time and again that they are different from the rest and the most, which is fine. Indians sometimes are known to be cheap. Cheap in their behavior, cheap in their attitude, cheap in their mentality. India is a great country, and we are great people. But that doesn't mean we are perfect. And so, it makes no sense to me to just show the positive side of the country and stealthily protect the other side of the coin. Educated people in India are the biggest asset of the country, since they get the opportunity to represent India at all levels you may think, may it be global, economical or any other platform of exposure or recognition. Uneducated people contribute even more to the country by fact, but this contribution is not visible on all platforms of recognition. Being educated and being cheap at the same time, is thus a big sin in my opinion, because that brings about a very wrong perspective of the country outside the country itself. Specially referring to the expats of India. Let's come to the story now. When I was home this time round, for a couple of weeks, I opened my mailbox one day to find a mail from an acquaintance of mine at work. An Indian, lately educated in Denmark, and working in the same company as me. "Can you bring me 2 kgs of Haldiram Kaju Katli and 1 kg of Haldiram Besan ke Laddu?". For my international friends, these are really famous sweets in India. You should try them if you have not done so. I had offered to bring anything if he wanted before leaving for India, and he caught the moment to ask me for it while I was home. No problem. It is my pleasure to bring it, I usually don't say it for fun that "I could bring something for you". I mean it and I like doing it. But, under any circumstances, 3 kg of stuff was ridiculously large. I replied back and offered to bring half of it, keeping the promise as well. I made sure, we brought the right and good stuff. My father went to buy the stuff 10 kms away from my home, and back in the scorching heat of mid-May central India. Of course, he was covered, but still the effort and the expense was there. He invested his time in doing so, bringing the good quality stuff as demanded by my acquaintance. Why didn't I just purchase the sweets from the nukkar ka mithaiwala, who wears a white vest which is totally soaked in sweat and sells mithai's at really economical prices? That would not be nice, for an expat, I thought. I would not like that myself, so good stuff should really be good stuff. No doubts. Fine, my father is back with the stuff and I happily pack it. 1.5 kilograms of sweets go right into my 27kg baggage. It will be checked in, within a few hours, first at Indore and then at New Delhi to reach Copenhagen 24 hours after the first check in. "How much did it cost, papa? ", I asked. "It was for 400 and 150, and you can ask a bit more for the bringing and carrying the weight to Copenhagen, it is normal. ", was the reply. "Sure, I must. ", I replied. I could take anything else for my own use in this 1.5 kgs, which I would otherwise be buying in Copenhagen. I could take 6 200gm toothpastes, or some eatables, or some tissue papers (he he, not the best example, but you get the point!). Back in Copenhagen, the guy comes to pick up the stuff. Interesting things we talk, we chat. After 10-15 minutes, on his face I can read the following expression, "Where is the mithai, dammit". He looks at his watch pretty often now, desperate? So well my friend, here is your mithai. Great! Vow! Thanks. "How much would it be? I will transfer the money into your Indian account! ", he asks and cites respectively. "It would be 700 and 150, totaling to 850 Rs. ", I said. "Sure, I will send you my account number, right away", I added further. And I did that when he left. Next day at work, I am pinged by the same person over our internal messenger, with extremely sweet opening lines and smileys thrown all around. Coming to the point after a while, he tells "How much was the Kaju Katli for, 400 or 700? Oh you know, my wife, she actually called the mithaiwala (Madhuram in Indore) and asked the price for a kg. He told it was 400, so wanted to confirm from you before transferring the money. OK once you confirm, I will transfer the money." I was taken aback. Shameless creature, has called back to India and asked the price of the stuff that I have brought for him. What? You got to be kidding me! So, this is where the cheapness comes in. Till then he was an educated young man for me. Maybe not anymore. That was an insult, literally. First. We spend money on gasoline to bring the stuff. Second. We spend our time and effort to bring the stuff. Third, I spend a full 1.5 kgs of weight that could be used better, only for someone to thank me back by checking the price. As a matter of fact, excess baggage for a flight costs more than a 1000 Rs. per kg. By that standard, I should be charging him well 1500 Rs over the cost of the mithai. Wouldn't that be fair? And moreover, it is a norm in India to consider the extra charges one has incurred for taking stuff for other people outside India. Has the mithai poured down from the sky just for you, someone has put an effort in bringing the stuff, eh? Instead of being thankful and pleased to be tasting good quality Indian sweets in Denmark, this person is retaliating back and confirming the price of the product and moreover telling me that this is what he did with pride, called the mithaiwala in India. In any case, this person is none of my good friends or any relative. So, why should I even think of bringing stuff for him, without anything in return. In any case, ordering a kg of Kaju Katli through post from India costs no less than 1000 bucks. So, in no circumstance am I cheating or taking advantage of the situation. It is simply taking my right. But sometimes, educated people and their even equally educated wives, become two brains and a supercomputer of calculations which leads to extended smartness and thus unnecessarily cheap behavior. This happens only sometimes though. As from my previous thoughts, India is a country of over one billion and this is just one tiniest of an example. Too little to generalize for a community of people from a nation, but a huge incident when it comes to adding another feather to your hat of experiences. I would rather keep away from budging from my position now, and take the entire amount only. Else, I will understand this person cannot even afford a 300 Rs. (or a 40 DKK) expense because of his lack of common sense. That is a rather bad bargain, I would like to pay 300 Rs. extra and at least consider myself to be a person with common sense. I promise to pay him and his wife 2 DKK each for the call to that mithaiwala. I was flying, high in the sky. This is 2010 and mankind has invented airplanes to make their way through the sky at amazing speeds. Having moved through cities, countries, continents, and a few other airplanes, I started my Turkish Airlines flight from New Delhi and was just about to land in Copenhagen, via the capital of Turkey of course. It was like a dream; where everything below me outside the window was white. It was a huge uneven blanket of clouds, that seemed to have no end horizontally. It seemed like we were descending into an air of clouds, slowly and gradually, and that was the end of it, vertically. The sun was just about to vanish down in these clouds on one extreme end, so there was still some light. I later realized I was fortunate to see the sun, even though it was in it's dilapidating state for the day. Once we were floating in the clouds, everything was dark. Suddenly, we had some respite; I could see land and lights, laden with snow white. These clouds were really thick, and the sun had no chance of penetrating them, even at it's height. It seemed like I was literally snatched away from home now and I could have blamed the clouds for that. Suddenly, those last moments while leaving my home city were replaying in my head, while the airplace was taking me down. "7:30 we shall leave", I said to my father. He nodded, the airport was only 20 minutes from our home. He said, "I will see if our regular automan is there, else we will order a taxi". That was fine. The flight was for 8:40 PM. Even though it was a bit late to leave at 7:30, well it was my country, and how could I miss it. It was already 7:45 by the time we left home. It kind of became a bit shaky while leaving, last minute checks if I had taken everything and all. While we reached the ground floor, my mother remembered that she forgot my jacket at home. No problem, we still have time, nothing to worry about (yet!). The auto started and my mind was going through the checklist, crossing every single thing on the way. While the automan made turns here and there on the chaotic Indian roads, I was driving my own way, in my mind. And in the background, my lovely mother was speaking, "Remember to remove the sweets from the bag, and try to finish it in two days, else it would get spoiled". I noticed it and said yes. Suddenly, from nowhere, I get the first shock. The auto comes to a standstill, boom! Just like that. We stop by on the side (well, sometimes, vehicles in India just stop in the middle of the road!) and with a brief investigation, the automan reveals that the fuel pipe has broken apart, and seems all the fuel has got away (into the air!). Fair enough, let's take another auto and hurry to the airport, "Aall iz Well". I lifted the 30 kg bag from the back of the auto, inserted it into the other one, got seated and off we go. Withing a few seconds, I was wondering, why is this automan driving so slowly and talking so much. If you peeked into him with one question, he would just not stop answering and jumping on to other topics. Beware! But that was not my concern; my only concern was talking more was resulting him in driving slowly. And he knew we were in a hurry. He took us into some strange street which we hadn't seen before. The main street was under construction, so we had to divert, through quiet residential areas, on a Monday evening. As we were getting out from those small streets onto the main street, the left turn proved crucial. A couple of traffic policemen were posing in the corner just around their parked bikes, and checking vehicles for their papers. One of them suddenly eyes the automan and there, he just had a connection with him. Vehicle drivers and traffic policemen have a very special relation in India. He asks the man to stop, by waving his hand as an order. Obey the orders, the only option. "Show me your DL and the auto papers", retorts the policeman. "Everything is in order sir, believe me! ", replied the automan. "Show them to me, come on". "Sir, these passengers have to go to the airport, they are in a hurry". And I and my father plunge in with some words here, "Yes, please, we have to hurry up, I am about to miss my flight". "So, in that case, leave your DL here and come back and show me the paper's", decides the policeman. "But sir, ...., okay I will show you the papers". "I am keeping this. Drop your passengers quickly to the airport and come back here". Shocked is the automan as we are, nothing can be done though. The automan tries to convince the policeman but how could that be possible. We take off, again slowly and steadily. It is now 8:08 PM already. The automan now had a lot of stuff to talk about while driving, he needed a topic as I said. "Why do these guys do like this; I have all the papers, he should have left me; now I will have to go back again; maybe he won't be there at all now, and I will have to go to the police station then; it's a long chakkar for me...". He never stopped. What stopped was the auto though, once again. This time, it was a marriage going on in one of the halls alongside the road. And a bunch of people were on the side streets (actually, they were on the street) celebrating their moment. Traffic jams due to marriage celebrations are common in India, and within just seconds, we were stuck in one of them. The third stoppage for us. The automan, though, was still talking about his grudge on the policeman. Anyway, the airport was just 3 minutes from that place, and we reached finally. Got out of the auto, took the luggage and rushed to enter the airport, when I suddenly remembered, a policeman stands outside the entrance gate as well, checking the tickets before allowing you inside the premises. Whoa! I had the ticket number on my mobile, and this guy isn't a computer! Anyway, I showed him the number on the mobile, and was expecting to have an argument with him to let me in. He pointed me to some office just around the corner, "Get the printout from there, the Kingfisher office". I rushed, to see a beautiful lady sitting on the other side of the window; she did as I asked her to, gave me the entire ticket printout. Well, she would not do what I want her to, because I will never ask her that! Anyway. The policeman was happy, my parents bought the ticket which allowed them entry in to the premises, and I was on the way to the check-in counter with a few minutes to take-off. "New Delhi" I said to the lady at check-in counter, and she smiled back and taunted, "The boarding has begun already, sir". I had nothing to say but, "Stupid traffic!". Well, and stupid auto, and stupid automan, and stupid policeman, and stupid marriage, and stupid me (which should be first!). I got the boarding pass, gave a big hug to my parents from over the small fence, and rushed to the borading gate. I was the last one to enter the bus, which took us the the aircraft. At the end, everything was smooth, well, relatively. As I sat in the ATR aircraft, one of the smallest aircraft's used by Kingfisher in India (they also own A380! ), amidst one and only one gorgeous, red from top to bottom, air hostess; and whilst some soft classical music was being played in the background; I could only think, what journey home it was. I was going up then, and I am coming down now. The landing in Copenhagen was smooth, and the small girl sitting next to me was rejoicing alongside her mother. If only this is my trip back, I have a lot more to say about the trip itself. During the last Christmas, I attended a proper traditional Christmas party with my work mates from Motorola in Copenhagen. "Julefrokost" is what it is called, which literally translates to Christmas lunch (though it is a dinner in practice). The Julefrokost traditionally starts with a strong alcoholic drink called Schnapps, which is very famous in northern Europe, along with the Herring fish and pork fat butter; all just to warm you up. For us then, the buffet was ready in some time with a good variety of food. After the dinner, some artists came up on the huge stage in front and live music started rolling. Later, the DJ was on and so was the night. At the end of all this, I wondered, what really is religious about this way of celebrating Christmas? I had no answer, until I was part of my second Julefrokost with a set of friends from the Danish language class. We went to an Italian restaurant, drank Italian wine, ate Italian pizza and topped all this with a cool Italian dessert. I ended up flushing 350 danish kroners on myself. While on my way back to the train station, my Danish language instructor, Torben, walked with me. Just out of curiosity I wanted to know what they did in the church on Christmas and how it was celebrated as a religious festival. I put up the question to him, and his answer was pretty simple: I don't go to church. I don't believe in God. I was shocked in some ways. It is a fact that until you think on the state of a particular matter as it is in a foreign country, you always assume it to be like how you have seen it or how it was in your home. Indians are religious people, and we go to temples and even keep the photos and idols of our "favorite" Gods at home. Hence, being in Denmark would make me think that Danish people are religious as well and go to church like asked in Christianity. This belief was killed right after I come across the person who told me just the opposite. Torben went on to tell me some more things, and we had a nice small discussion on the state of religion in western Europe. It is not only him who does not go to the church, it is a common phenomenon in the whole country! His argument was simple: we have other priorities in life than going to church or believing in God. But why? Because we are happy as we are and we don't have the time for it as well. Okay, this made sense to me. The Danes are among the most happiest people on earth. Though the sense of happiness here comes from the sense of being content. They are satisfied with what they have and don't live life with big dreams like Americans, who have been inheriting it. Moreover, they are a bunch of really secure people; secure socially. The children get education, the sick get treatment, the unemployed get money and so on, which is all for free. So, people basically have everything and need nothing more. So, why to ask God for anything? Much of India in contrast is a poor state. We have problems which are deeply rooted and need a reform immediately. The standard of living is usually not good and the basic necessities of life are not available in rural areas. Amidst all this, it is quite clear that religion and our Gods offer us the support of going on in spite of problems and difficulties. For a farmer whose future depends on rains, the only option is to ask God for it and have faith in Him to save him each and every year. A farmer in Denmark would not be worried because he would be paid by the state if he comes across a bad harvest. So I think, the more content the people are, the lesser would be the relevance of religion. America is a developed nation, but people are not happy. There are social problems which frustrate people. So, religion is still a big thing in America. Only 19 percent of the people in America are atheist's. The rest either believe in religion or doubt the existence of it. But 81 percent is a huge number, as compared to Denmark's less than 50 percent. Around the same time, I had a chat with my Danish neighbor. We started our discussion on the same question which is why Danes don't prefer going to church (he also doesn't). Following this, we somehow ended up discussing the Danish cartoons controversy. His attitude on the controversy was very liberal. He never said that the cartoons were just for fun and should not have been taken so seriously by Muslims, but he was also not opposed to the idea of the cartoons being published. I was not very happy with his reaction at first, as I believe that this cartoon act was totally unacceptable, whatever be the degree of openness and freedom in the society. But then after a while, the reason for his arguments actually began to come to my mind which made sense to the whole concept. If someone is not religious, he or she would not believe in any other religion either. And this in particular could result in the possibility of them hurting the faith of people following some or the other religion. Most Danes don't go to church anymore. Christmas for them is just another occasion to meet family and relatives, or have a party apart from this. Without a religious conscience, drawing a bomb on the head of Prophet Mohammad can be of great fun for the cartoonist thinking it would be great fun for the Danes as well. What he unconsciously did not realize was the fact that there is a set of people having religious sentiments with the Prophet, while he doesn't have a sentiment for any religion. The bottom line is that the frame of reference of the two cultures (Danes and Muslims settled in Denmark) is different when looking at the same thing. While Danes are not believers in God, the Muslims still are to a great degree. The movie Religulous by Bill Maher tries to question the existence of God and the relevance of religion in today's world. Stories of the birth of Jesus Christ, and tales written in the Testament's are fine; but the big question is how can one ascertain that these incidents are real and not just some fantasies. It is something that no one can tell, but we can in the best situation give an answer of "I don't know". This state of being helpless in being able to determine the truth behind how a religion came into being is also diverting people away from it. I consider myself in the category of those who doubt religion, which doesn't mean I doubt in God. I still believe that there is a mighty force around us. But has this force taken the form of Jesus or Prophet or Krishna is something I cannot tell and thus something I doubt. I still get a sense of confidence and support from this force, and I also don't mind going to a temple and singing songs while remembering Krishna or Ram, just because I am not an atheist. Long time being away and I am back. I should say that there were several occasions in the past few months, when I stopped by and thought about making a post on my somewhat dying out blog here. There were many thoughts around the corner and some interesting incidents as well. But, then, I was never able to convince the guilt-producing self of mine, that it would take just half an hour to pen down these thoughts. I could not make one hence in the last few months. Today I finished much work of my master thesis. I have to now just prepare a ReadMe file for my working C programs, and burn 6 DVDs with them. And ofcourse, I have to skim through my thesis printout and keep a vigilant eye for any last minute errors that could have creeped in, which always exist at such a time. Apart from this, I am pretty much done with my submission which is due for the 10th but I would be making it on the 9th itself. And so with such a free mind since this evening, I had to watch a nice movie to really freshen up myself even more and further, get into the old habit of watching hindi films, alone! A Wednesday was on the top at videomasti.net; after taking note of the review very briefly, I decided to watch the movie. Must say, from the name one can make out that it is going to be a suspense or a thriller movie, moving around events in just one day. And moreover, prominent names like Anupam Kher and Naseeruddin Shah bring about an urge to watch the movie that no other factor can. After seeing the movie, I have no doubt in my mind that this is one of the best movies made in recent times. The background in the movie is the serial train bomb blasts in Mumbai, and the degree of imagination of the writer seems truly genious. The climax is simply awesome, which I would not want to reveal here, but just praise and praise. To be truly honest, the Hindu-Muslim division that extremists have exaggerated for no justifiable reason, looks lame; crying out for a ceasefire on such thoughts and actions in the society. What is shown in this movie and some previous movies on the same lines (like Aamir) reflects why normal people are frustated of the divisions by religion, which is not what religions have been made for. I am a software engineer by profession, and love writing, reading, thinking, discussing, learning, exploring, traveling etc. in my own time.